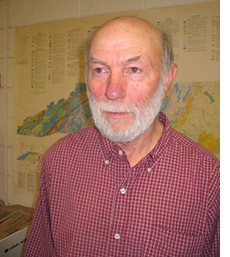 Harvard Ayers is a Professor Emeritus of Anthropology at Appalachian State University in Boone, North Carolina. He still teaches several courses including Arctic Anthropology, which is composed of a two to three–week field trip to the Arctic of Alaska and adjacent Canada. Senior Author of “Arctic Gardens—Voices from an Abundant Land”, published in 2010 by Arctic Voices, a non–profit publisher. This book is Ayers' second project of this type. Earlier, in 1998, he was Senior Editor of “An Appalachian Tragedy—Air pollution and Tree Death in the Eastern Forests of North America” (Sierra Club Books, 1998). He also teaches The Human Ecology of the Appalachians which features a weekend field trip to Whitesville, West Virginia, in the heart of the southern West Virginia coalfields. He has taught a course for 30 consecutive years called Southwest Anthropology, which features a 12–day trip to the Four Corners area to see Native American rock art and cliff dwellings. In 2006, Ayers performed the only professional archeology up to that time of a large and significant battlesite which was part of the “Mine Wars,” at Blair Mountain Battlefield, Logan County, West Virginia. He is now a plaintiff in a law suit challenging the actions of the Department of Interior in taking the Blair Mountain Battlefield off the National Register of Historic Places where it had earlier been listed. The battlesite is scheduled for coal strip mining if the law suit fails, which will destroy the 1600–acre battlefield. Ayers has founded or co–founded several non–profit organizations including the Sierra Club Native American Committee, Southwest Native American Art Foundation, Coal River Mountain Watch, Appalachian Voices, Arctic Voices, and most recently the Friends of Blair Mountain. His next book is to be titled, BP Gulf Disaster, Arctic Style—When Will They Ever Learn? It will be published summer of 2011, and will take a close look at Shell Oil’s planned exploratory drilling off the north coast of Alaska from the Iñupiat Eskimo perspective and his own.